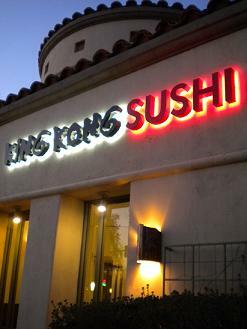 The name King Kong Sushi was not promising, making me think of low-end party sushi. And in truth, the food was merely okay. We had the Super Albacore Roll ($9), which was too spicy, overwhelming the taste of the fish, and acceptable fatty yellowtail ($5) and salmon sushi ($3.50). The menu does have some creative-sounding items, such as rolls with rice paper or without rice. But it also has Korean food. 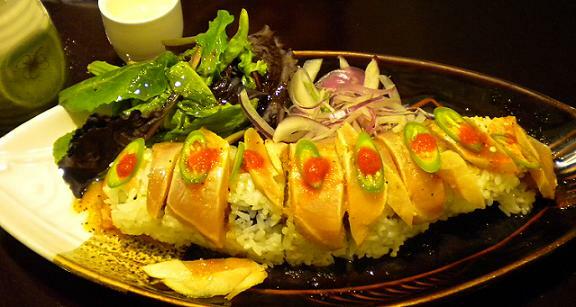 I may go back, but personally, for sushi in Claremont I prefer Kazama and Hayato. This entry was posted in Restaurants: Claremont by David Allen. Bookmark the permalink. I was first introduced to Koo Koo Roo in the 90’s when I was traveling to downtown LA, every Friday, on the Metrolink. It had a great Chinese Chicken Salad, Ten-vegetable soup, which was delicious when they had it, and Macaroni & Cheese to die for. They also had fresh roasted turkey, with all the fixins, daily. I was happy when it opened in Claremont. I guess people in the area never warmed up to Koo Koo Roo, and then I regretted when it closed down in Claremont, and a Chinese fast food place followed, in that location. At least I was self-consoled that I could still go to Koo Koo Roo in LA. But, to add insult to injury, the LA Koo Koo Roo was a victim of the great economic crisis, and it is now gone too. What a loss! I have never been able to bring myself to participate in the custom of eating fish raw. It gives me chills to think about it. Anyway, I hope the new Sushi place will have better luck than Koo Koo Roo and the Chinese place had.